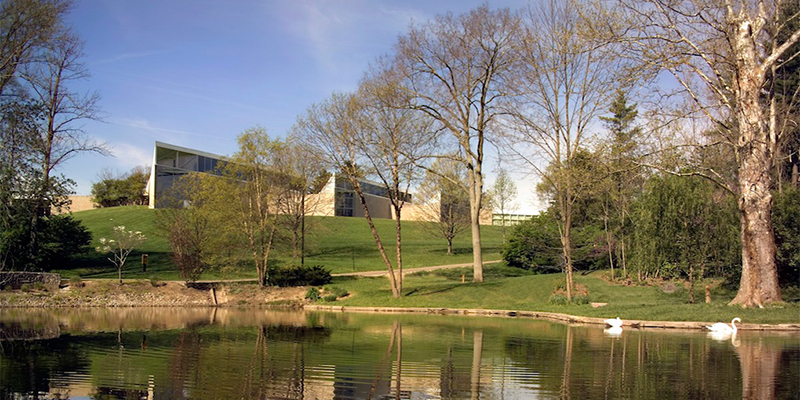 The Miami University Art Museum, completed in 1978 was designed by Walter Netsch of Skidmore, Owings and Merrill, Chicago, and is situated on three acres of scenic sculpture park grounds. We house five galleries of changing exhibitions and a growing permanent collection of over 17,000 artworks. MUAM is accredited by the American Alliance of Museums (AAM). The Miami University Art Museum will be a regional leader contributing to the educational and cultural enrichment of Miami University and Southwest Ohio communities through the preservation, presentation and public programming of diverse visual art of all forms. We value collaboration between students, faculty and staff, as colleagues within departments, and as artists and scholars across artistic disciplines within the division and across campus, with a goal of learning from each other and benefiting from a healthy exchange of ideas and varying viewpoints. By listening to each other, we gain a shared understanding of complex ideas that allow us to rethink accepted perspectives. The College of Creative Arts seeks to foster a spirit of collegiality, trust, and dialogue by providing members of its community with an environment that encourages open sharing of ideas and values, and which fosters collaboration within and across institutional divisions and constituencies. The College seeks to structure communication and interaction that is characterized by mutual respect, sincere dialogue, and protection of the rights of individuals. As creators, performers, practitioners, and scholars, it is our imagination that is at the center of our ability and desire to create new art and to craft new environments and forms of expression. By placing high value on imagination, we commit ourselves to rethinking the status quo, while allowing for new ideas and solutions to emerge and to take shape. The construction of the Miami University Art Museum was made possible by private contributions to Miami University's Goals for Enrichment capital campaign in the mid-1970s. A major gift for the building came as a bequest from Miami alumnus Fred C. Yager, class of 1914. Walter I. Farmer, class of 1935, and former Art Department faculty member Orpha B. Webster generously donated extensive art collections, instrumental in developing early support for the museum. Business Hours: Monday - Friday, 8 a.m. - 5 p.m. The Miami University Art Museum pursues an active role in the overall cultural life of the southwest Ohio region, recognizing dual goals of public outreach and university cooperation in keeping with the broad scope of a university that emphasizes liberal education.